soak the nuts and buckwheat in double the amount of water for a couple hours (or in the fridge overnight if that’s easier). drain and give it a really good rinse. put it in a good blender (or food processor) with the chopped apple or pear, vanilla and lemon. add enough milk to blend. the amount will depend on how powerful your blender is, anywhere from 3/4 c. to 1 1/2 c. start with a little and add more as needed. you want it pretty thick but you don’t want to kill your blender*. keep blending until smooth. eat it right away or put in the fridge! i like to puree some berries or cook down strawberries and use it almost as a syrup. real good stuff. 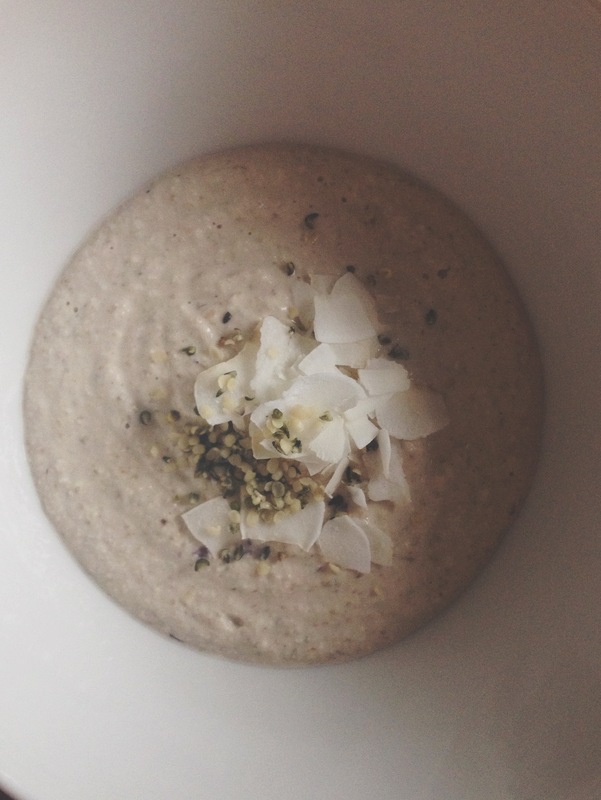 top with seeds and coconut ribbons, hemp seeds, any of that good stuff that you like. *if it’s hard to blend, try it in 2 batches so you can get it real silky smooth.